Battery charger for pre-war 6v & 12v cars. Homepage. 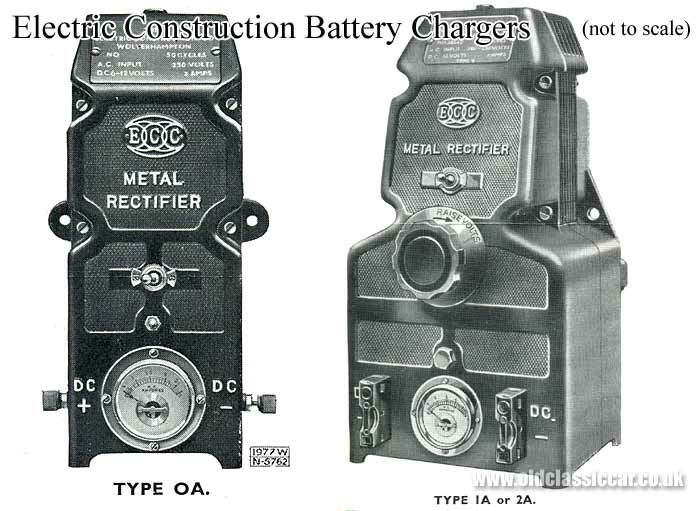 This page: A pre-war leaflet describing the English Construction Co. Ltd car battery charger. This leaflet for a battery charger was published on behalf of The Electric Construction Co. Ltd. of Wolverhampton, and their range of car battery chargers. Established in 1882, not only could they supply chargers, they were also manufacturers of rotating electrical machinery, transformers, rectifiers and switch gear, so branching out into the supply of garage equipment seems like an obvious decision. 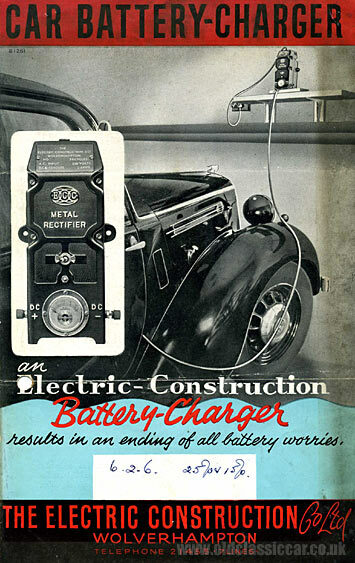 The cover features a pre-war automobile hooked up to the charger, the car's owner no doubt relishing the prospect of ".. an ending of all battery worries". The ECC Metal Rectifier was a sturdy-looking piece of kit, and I suspect that in a collision with a hapless motorist, his or her car might well have come off worse to the charger unit. Proper engineering, built to last. The model shown on the cover is either an OA, OB or OC model, depending on whether the user wanted the option of charging 6v & 12v, 2v & 12v, or 2v & 6v batteries. The charger's casing was of "industrial pattern" and finished in black enamel. Each model featured a 0 - 3 amp charging gauge, with + and - connectors on either side of the case. It could be wall or floor mounted or, as in the example shown on the leaflet, sat on a convenient shelf. Specially designed for the needs of the private car owner, and equally applicable for the charging of lorry batteries. Eliminates the use of starting handle; ensures quick starting from battery even in worst possible winter conditions, and maintains a healthy battery with consequent trouble-free service. Simple and reliable home charging at infinitesimally small cost. Of great value to every motorist and absolutely indispensable to the motorist covering only moderate mileage, or whose car has such accessories as car radio, de-froster, interior heater of the resistance type, cigarette lighter, fog lamp etc. Compensates for faults such as accidentally leaving on ignition dash-board light, trafficators, temporary short circuit of wiring, condensation etc. If the OA/OB/OC charger wasn't quite man enough for the job, then the 1A or 1B might be of more use. This larger unit allowed the car owner to vary both the charging rate and voltage, with models 2A and 2B being very similar but charging at a higher amperage. Regularly starting a car on its handle, especially if the engine wasn't in particularly good tune, could easily lead to the motorist nursing a poorly back, or even a broken thumb if they weren't holding the handle correctly and the engine kicked back. So a fully-charged and reliable battery was a "must". While regular charging of a ropey battery wouldn't return it to health, it would at least enable the owner of a pre-war or vintage car to eke out a little more use from their battery by repeatedly re-charging it, before it gave up the ghost altogether. New batteries could also be maintained in tip-top fettle with such a device, so the ECC charger would be of use to owners of worn-out Austins, and coachbuilt Bentleys alike.